After much anticipation, we're excited to finally be able to announce the official winners of the 2012 Rising Star Awards! Hooray! We know there's been a lot of hoopla around this announcement (that's if you count multiple videos, a press release and dozens of tweets as hoopla) but that's only because we know so many of you look forward to this all year. The Rising Stars are based entirely on booking revenue earned from GigMasters bookings and only client-initiated gigs count towards the awards. To calculate the winners, we group our performers and vendors by category so that clowns, for example, do not compete against cover bands and wedding tent rentals do not compete against string quartets. We work hard to promote all of our members and the Rising Stars are just our way of honoring our most booked, highest-earning members. We consider all of our members as our partners and will continue to do everything we can to get you gigs whether or not you won a Rising Star this time around. Awards given to highest earning, most booked event vendors and entertainers in 142 categories including Top DJ, Top Comedian, Most Popular Wedding Band, Most Popular Corporate Event Entertainer and more. South Norwalk, CT (January 30, 2013) —The web’s #1 event booking service, GigMasters.com, has announced the winners of the 2012 Rising Star Awards recognizing the top event musicians, entertainers and vendors in the U.S. and Canada. Best known for booking musicians, DJs, comedians, magicians and other live entertainment acts, GigMasters has begun to broaden its vendor offerings to include event services such as limousine rentals, wedding tents, bartenders and more. This expansion is reflected in this year’s Rising Stars which have been awarded to 142 winners, a record high for the sixth-annual awards. 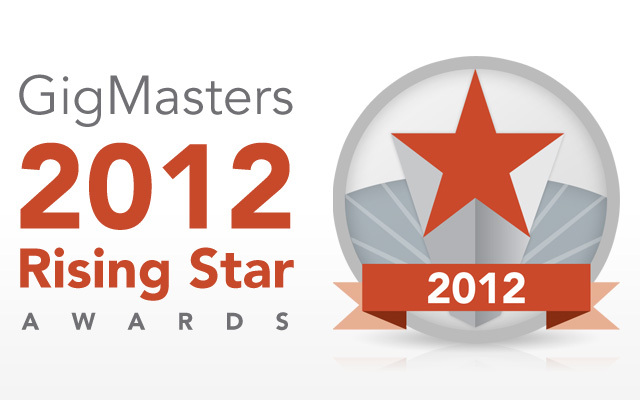 To see the complete list of winners visit: http://www.gigmasters.com/about/rising-star-awards.aspx.